Published in 1997, written by Mitch Albom, with the leadership and guidance of his college professor, Morrie Schwartz, this under 200 page volume is full of simple answers to existential questions regarding the importance of human existence. Nearing 16 years later, after watching a “Nightline” report by Ted Koppel, Mitch discovered that his longtime guide, Morrie, was suffering from ALS, Amyotrophic Lateral Sclerosis, or Lou Gehrig’s disease. Mitch had spent his life working in media, specifically as an acclaimed sports columnist. Mitch has been voted America’s #1 Sports Columnist ten times by The Associated Press Sports Editors. With a successful yet spiritually unrewarding career, Mitch set out to reunite with his longtime friend and “Coach.” Unbeknownst to Mitch, this visit was to be his last thesis. 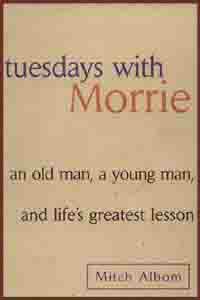 He met every Tuesday with Morrie, watching his disease progress, tape recording their basic conversations about life. This volume touched me deeply. The ideals and conversations documented by Mitch exhibit the inherent basic needs that must be met for happiness for spirits existing in a human shell. Mitch’s writing is not complex, it is precise and on the mark, exhibiting exactly what he meant to portray: a conversation with a man he admired facing life and death, simultaneous. Books such as “Tuesdays with Morrie” prove that the human condition is a fleeting one and that every moment must be savored, admired, in the here and now, not later. I learned that everything I strive to complete really does not matter at this precise moment. What truly matters is that I am grateful for my limbs that work, that I am able to think, speak and write that I practice compassion and kindness to the best of my ability and must continue to do this. Most importantly, that I am able to love and forgive myself and others for simply being human. Everyone must read this book. It is one full of aphorisms of wisdom. It is a volume filled with unconditional love. I read this short but unforgettable book as my Dad was dying from. Parkinsons Disease. Mitch is Morrie’s former student. Morrie us dying of ALS and Mitch happens to catch an interview with Morrie with Ted Keppell. Mitch is so confused without knowing it concerning priorities and values that he goes to see his old Prof. From that comes Tuesday meetings where Morrie teaches Mitch about LIVING , not dying. It is a simple book. And not really a tear jerker. As Morrie gets closer to death Mitch gets his prioritiries straight. I chose this work to review because as a teacher, now retired, it had so much influence on my students that years later they ask ” who was that wise old manee read about” ? I call Morrie’s lessons. Morrieisms. 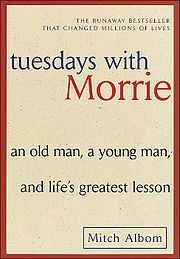 I cried through the book but I learned so much about my favorite Morrieisms” you can’ t learn how to live til you learn how to die”. It’s also a true to the book movie of the same name. And is Jack Lemmon’s last role. I watch and read it periodically.